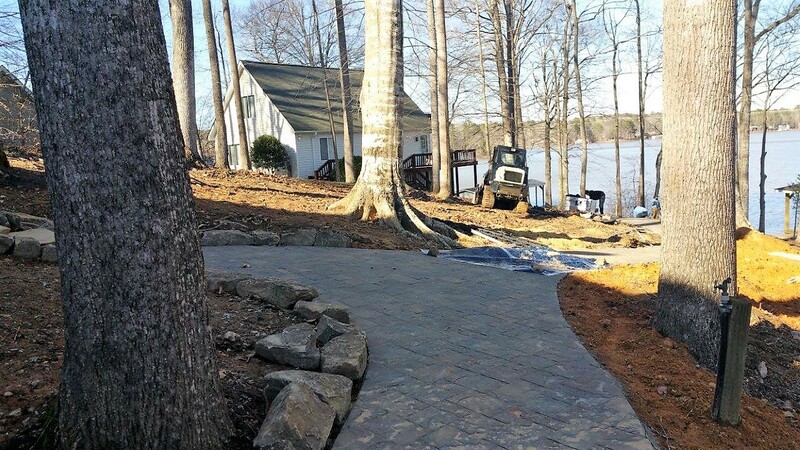 Work proceeds on this walkway project, which stretches from the driveway, around the house, and continues on down almost to the boathouse. 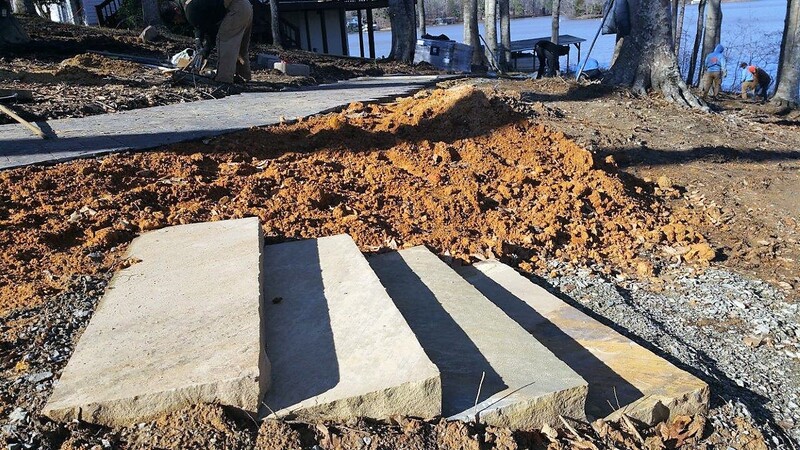 Since our last post, not only is the walkway almost completed, but the Lincoln Creek stone slab steps have been installed, as has the firepit. As we said last post, the adapatable Belgard materials we are using are well suited to the twists and turns necessary to navigate the topography, trees, and shrubs, while the cut flagstone appearance of the stone steps blends in nicely with the natural surroundings. … now our guys have turned the corner and extended the walkway almost to the boathouse. We’ve installed Lincoln Creek stone slab steps at three places along the walkway. These are large single block steps with a roughhewn, unadorned, naturalness that is quite striking. Our guys manually place each block on terraced groundwork to form a kind of rock glissando – aka, steps! … and these access the new firepit we installed at the half-way point. The last piece to this project is a retaining wall edging the driveway and stone paver steps transitioning to the walkway. When finished, this customer will have a pristine and elegant solution, from the driveway, around the house, and all the way to the boathouse. Finished photos will be posted soon. See something you like? Contact us for information or an estimate!